Above: My family and my Uncle Soner's family pose for a picture on the balcony of our resort room in front of the scenery. 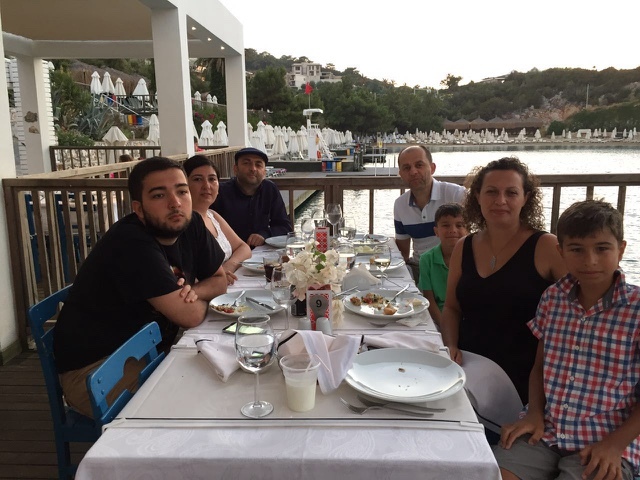 From left to right: Aunt Nermin, my dad, my mom, me, Uncle Soner, and Onur. Hello guys, this is Arca! I haven't blogged in a while, since I am in Turkey. 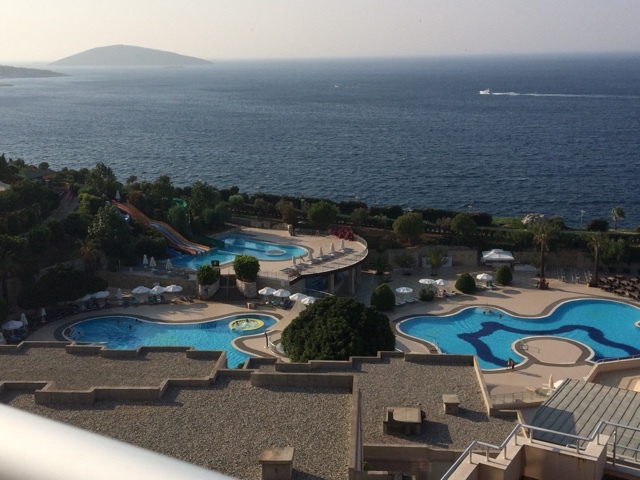 The previous week I was in Bodrum, but now I am in the capital city of Ankara. 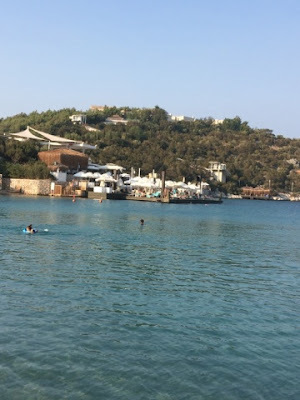 However, this post will be about Bodrum. 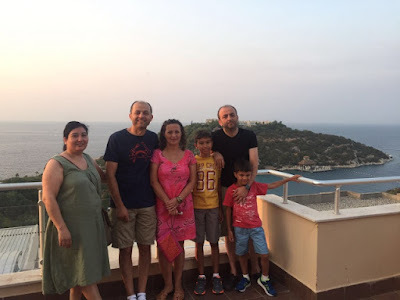 My family stayed there with Uncle Soner and Aunt Nermin. Their son, Yiğit (who is now in college), also came. Bodrum has a great beach right in the Ege Sea. 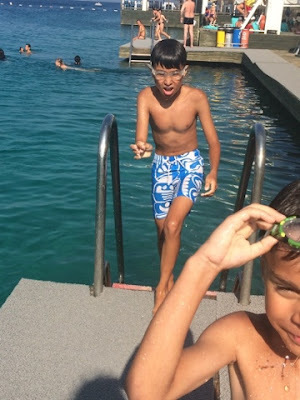 I really enjoyed swimming there. The water wasn't too overheated, nor too cold, and there wasn't any waves. This was because the beach was in an mostly enclosed area, so most waves didn't get through. However, there was occasionally a few waves made by boats passing by, but they ended quickly. The resort we stayed in was called Hilton Bodrum Türkbükü. I decided to give it a review here. I will divide it into five sections: food, beach, pools and water slides, activities and entertainment, and hotel rooms and the look of the place. My overall rating for the place is 4.7 out of 5 stars. Above: All of use sitting down at a restaurant in the resort. First of all, the food was pretty good. They had ice cream everyday at the buffet, as well as tasty Turkish food. Not only was there Turkish food, but also food I am used to eating all the time, like spaghetti, pizza, and burgers. They had plenty of Turkish deserts. Above: A photo of some of the water at the beach. In my opinion, the beach was my favorite thing there. It was great to swim in, and there were many decks that I swam across to. I noticed that after swimming to a small hut that looked abandoned, that it was actually a massage center. We swam back to it a few times, but it was always empty and looked like it was in the same exact condition as before, with the same water bottles and towels lying around in the same place day after day. I really think someone should look after this place. Since if anyone orders a massage, I do not think they would want to have it in a dirty place like that! Above: A photo I took from the balcony there. It shows the overall view of the pools and water slides. The pools were actually a lot bigger than I expected. I only swam in them a few times, so I feel that they are basically your average pool, except a bit cleaner. The water slides were all really fun! There were 6 of them total. There were three yellow ones, which were all the same. There was also a big blue one that went around in circles. The most fun one was the red one. It was very steep and fast. Even though it only lasted about 5 seconds to ride, it was very fun. However, I have a few complaints. The green one was never open. I think that it may be broken. They should have fixed it already. Also, the slides were only open for a limited time each day. I am not saying that they should be open all day. It just may be better if they keep it open for at least a few more hours. Above: Me and Onur walking out onto the deck on the beach. There were many activities that you could sign up for. They had many water sports that you could try lit, including water skiing, sailing, and paragliding over the water. I didn't get to try any of them, but I want to do it next year. They had games of dart and volleyball that you could go to anytime you wanted. There was also a kids club. The only thing we did at the kids club was sign up for this contest where you could win an iPad or a vacation package by playing an online game. That will happen sometime in the winter. Every night there was some sort of show or trivia game. There were two places where the show took place: the amphitheater and the stage. The shows were nice except that you could only participate in the trivia challeges if you were 16 or older, so I couldn't do that. Above: The lobby of the resort. The resort looked very nice. 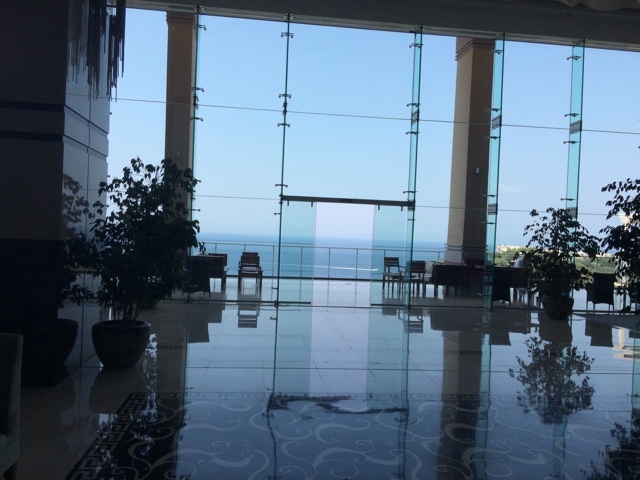 In the lobby, the entire main back wall was made of glass, so you could always look at the view, whether you were on the balcony or not. There were a lot of plants everywhere. Some of the floor tiles were just plain white and boring. A few of them had fancy designs and patterns. The hotel rooms were decent. It had everything you would expect. It also had a balcony for viewing the scenery. In my opinion, the balcony was too small. You ended up in a tight space. The better place for viewing was the balcony next to the lobby. The room I was in was decently sized. There was only one bed, so me and Onur slept in the couch while my parents were in the bed. That is all for my resort review. I also want to show you some more photos that we took there. 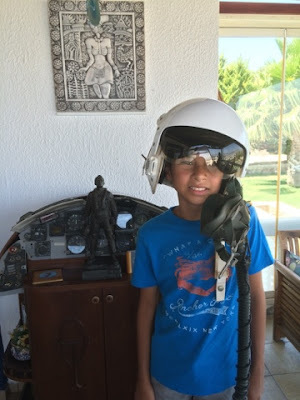 Above: The cockpit of a F104 fighter plane attached to a cupboard. We visited my mom's cousin's house. Her cousin's father was once a high ranking Turkish Airforce officer. He is now retired. 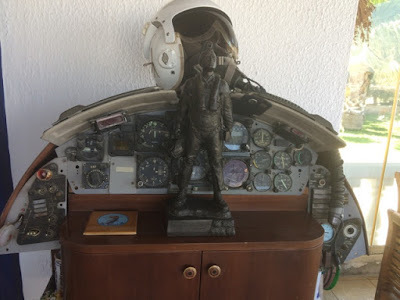 He showed us a part of the cockpit of his plane, his special helmet, and an award he received. Me and Onur got to try on the special helmet with an oxygen tube. You can see the pictures of this below. Above: Me wearing the pilot helmet. It looks kinda like the X-Wing pilot helmet from Star Wars. 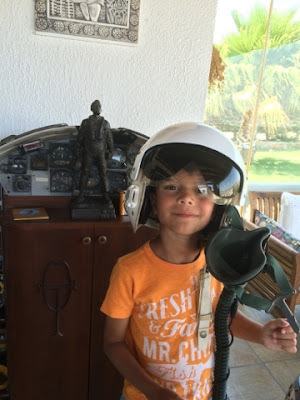 Above: Onur wearing the pilot helmet. I hope you enjoyed this post! I will make another post soon. I will also make a post about the Gravity Falls #CipherHunt, so stay tuned. I have about two weeks left of my trip, then I will return home. View daily and tell your friends to do so too, since my next goal is 20,000 views! If we reach that before Thanksgiving, I will show you a surprise I made for this landmark goal! And if we don't reach it by then, it is fine too. We hopefully (and probably) will! See you next time! BBBYYYYYYEEEE!!!! !